A retaining ‘frame tray’ is formed in Aluminium. 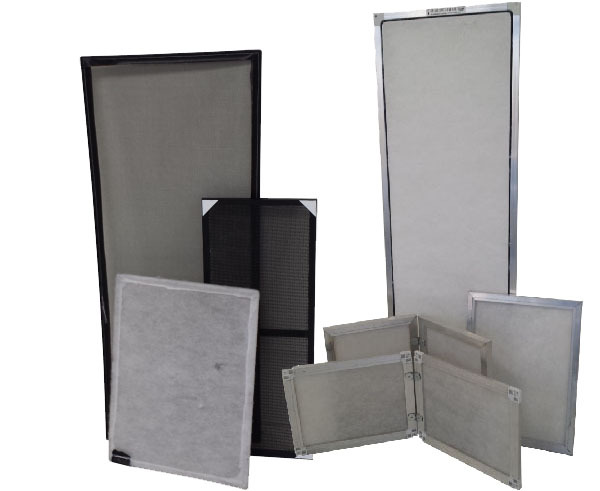 A filter pad is mechanically secured in the frame tray utilising a rubber spline enabling simple replacement of the media pad. The tray can be supplied with bracing on the air leaving side. A retaining frame tray is formed in Plastic. A pad is glued to the frame tray to provide a totally dosposable item.Ideal in situations where the filter may need to be flexed to be fitted. The tray can be supplied with bracing on the air leaving side.